Very warm interior greet you & make you smile. Pure Veg, Italian and Mexican and what not. The garlic cheese bread was yummy too…. The mix sauce fusilli pasta & mushroom risotto are the best I have had in The Urban Hub. Loved the presentation & flavours too. The pizzas were good but for me, TUK pizzas still remain on the Top !! Servers are polite & they take care of you at all times. I think the desserts at this place are their secret speciality. !!! Lovely place With Great food. 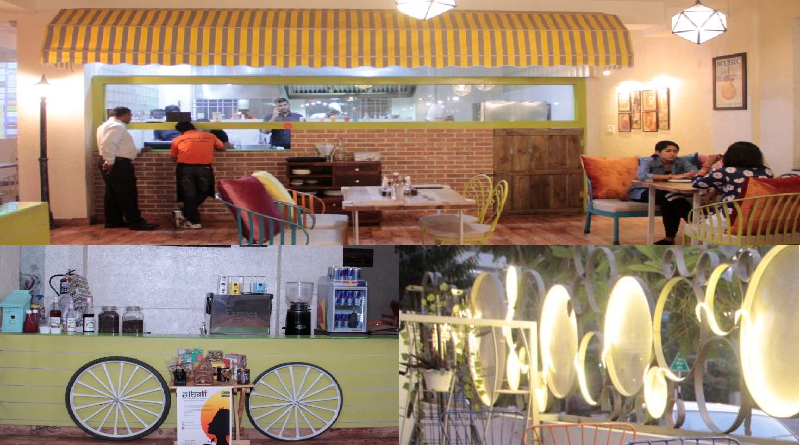 If you and your family are up for a great meal in a comforting ambience; try The Urban Hub.Mexican cuisine is very partial to corn implementation, beans and tomatoes while being ridiculously generous with spicy chilli. The Italians are very generous while they tediously prepare sauces fragrant with herbs and olive oil. Both cuisines heavily blend textures with rich cheese on the top, specific to their homelands, bound on different continents. While The Urban Hub does do justice to both heritages with the best vegetarian dishes; it was interesting to note a well-crafted and seriously exhaustive menu incorporating innovative culinary creations that experimented beyond the expected. Besides the nachos, Mexican rice, enchiladas, pasta and pizzas, prepare to try extraordinarily well-attempted quesadillas, burritos as well as signature infusions like the Lasagna and the pesto pizza. When you enter the restaurant the interiors, the ambience just blow you away with beautiful lights they have used over here. Then when you head inside they have this step like table arrangement witch Bright red, Blur, Green chairs and omg it looks so awesome. Eye without hesitating grabbed the tallest table which gives you the view of the open kitchen. You Can start with soups order for “Mexican Tomato soup” which was very spicy, also call for thai coconut soup which was decent, But ladies and gentlemen the prize goes to “Cream of Brocolli and Cheese” it was fantastic a must try. They serve the soup along with breadsticks and garlic bread and the presentation is indeed very nice. You Can order for Pizzas Wooden Baked and omg that was again excellent. They provide you with four different types of sauces olive oil based, olives based, tomato and cheese based and Basil based. Out of these Olive oil based which has garlic and a strong taste works wonders when combined with the pizzas. Then the next on the bucket list its Pasta. THE PINK PASTA ( don’t worry just the name is pink) and then we received heaven on the plate Pasta+melted cheese total Win mmmm nom nom nom. To finish things off you can go for their amazingly bound wraps( specially the tandoori paneer and falafel wrap). Totally worth it, To the management Both guys are doing an excellent job. An ideal spot for the young and old alike, The Urban Hub promises to pamper your palette with an exotic range of Italian, Mexican, Continental &fusion cuisines. It’s time to make space for all that is beautiful, it’s time to make space for The Urban Hub. The Urban Hub is an air-conditioned extension of The Restra; it is an indoor seating; an entirely buttoned up room. This room can be booked for individuals or for a small number of guests around 50-60 people; during which general public will not be allowed to use this place for dining so that you can enjoy your private dining experience amidst the various buttons & pleasant world music. This is an Italian cafe with a finely crafted ambience – subtle lighting, comfortable seats – that make the place rather cozy. Go here if you love thin-crust pizzas, pasta, ravioli, salads, risottos, stroganoff, and much more. It is a lovely place for family dinners, birthdays and kitty parties, etc. A warm, welcoming atmosphere, Habanero is a vibrant spot to kick back and relax with friends and family. With flat-Big screen and a performance area, it is also an ideal place to gather to watch a sporting event or to enjoy live music. Its proximity to company offices also makes it perfect for business meals and celebratory gatherings. What is a Coffee shop concept to be about? Peace? Bliss? Or a heavenly dive into the brewing coffee aroma? Well The Coffee Shop did manage to give you more than that. A live coffee brewing counter in front of you and a live pizza baking counter working right in front of your eyes is proof enough that this place is heaven! The Coffee Shop starts its day at 11 am and is the perfect place for coffee lovers who want to start their day with a delicious steaming cuppa coffee and some scrumptious bites. Their coffee is freshly brewed out of coffee beans and lends a heavenly aroma to the entire space. The cafe specialises in Italian food and their menu comprises of pizzas, pasta and an array of delicious starters.With soothing music, coffee aroma, courteous and friendly staff, addictive coffees and lip-smacking food at pocket-friendly prices, The restaurant operated by Two Brothers Karan and Naman. Karan Added “In the past five years, we’ve moved toward eating in our cars, our cubicles, and in front of our TVs. It’s very isolating, “The reality is that we connect through food, and we have the opportunity to do it three times a day.Normal fast food is full of calories and low of nutritional value, “People are overweight and starving at the same time. “The sidewalk outside The Urban Hub include a concrete walking path with new brick pavers, planter boxes with benches and electrical outlets for holiday lighting and new outdoor chairs and tables.